I have had the white gel Uni-Ball Signo UM-153 in my posession for the longest time, but being the non-crafty type that I am, I didn't have any good non-white paper to test this pen out on. It wasn't until I finished up my latest Doane Paper writing pad that I realized the cardboard backing would serve as a good backdrop for this review. 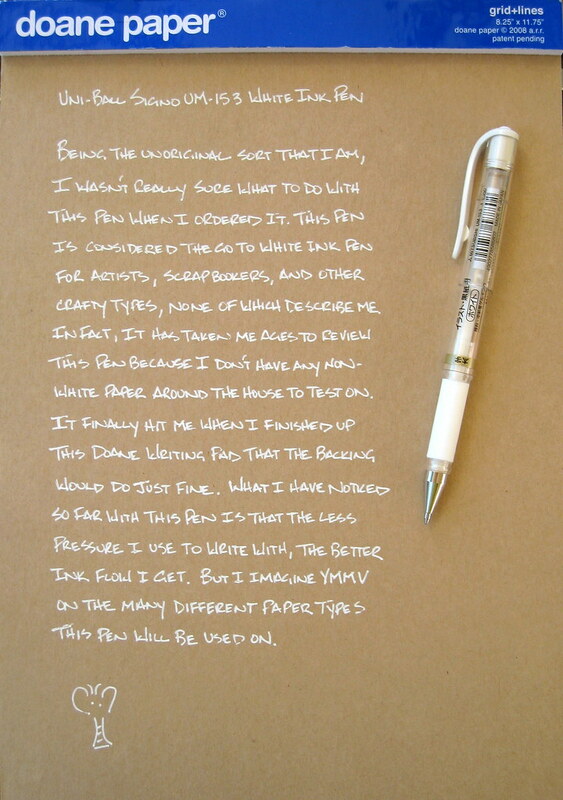 So, why a white gel ink pen? Me personally, I don't know, as I don't really have a use for this type of pen. But for the more artistic and creative types out there, this pen is considered the best of breed for white ink pens, so I thought I would see what all of the fuss is about. The non-white Uni-Ball UM-153 broad gel ink pens are some of the best wide tip gel ink pens around. Whenever someone is looking for a 1.0mm tip size or larger gel ink pen, I always point them towards this model and they are rarely disappointed. The white gel ink doesn't perform quite as well as the darker colors, but maybe it isn't supposed to. I don't have another white gel ink pen to compare it with, but a lot of my lettering was a bit streaky, but then other times it would stay relatively solid. I found that the less pressure I used to write with, the better the pen performed. Maybe someone with more experience with this pen can relate their experiences in the comments section? Overall, it is a nice pen, as you would expect from Uni-Ball. If you are looking for a white gel ink pen for any project you may have, this would be a good place to start. Click here for the XL review. Posted on June 14, 2010 by Brad Dowdy.